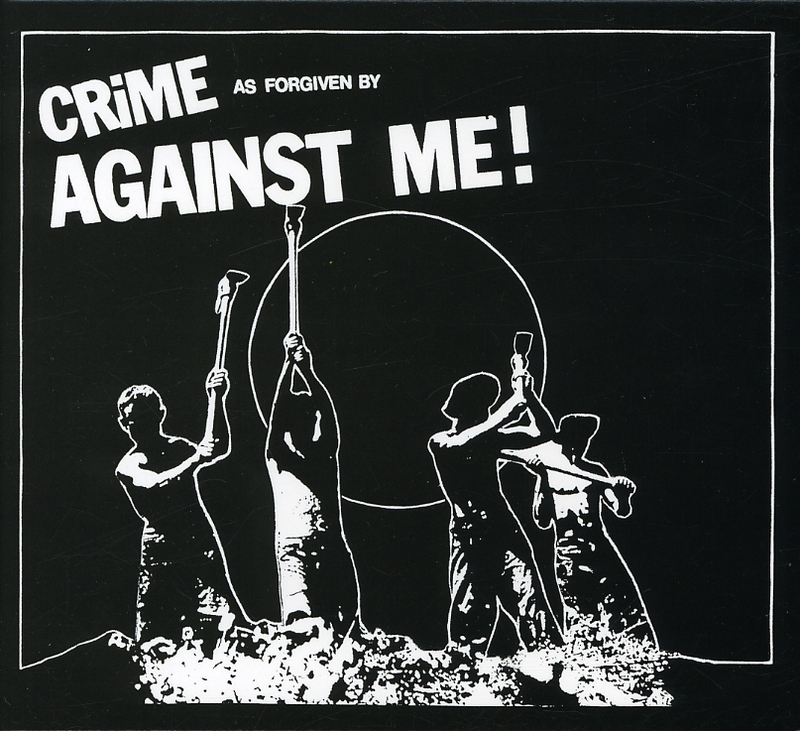 Henry Leach - Notes: Crime as Forgiven by Against Me! In 2001 Against Me! were two people, Tom Gabel and drummer Kevin Mahon. Much has been made of the evolution of Against Me! 's sound, signing to major labels and their biggest crime; success. But let's ignore that for now. Crime was Against Me! 's first widely distributed release, originally a four track, it is now printed with an additional two tracks. The arrangements are raw and simple; Gabel's guitar is clean, played hard and relentlessly. It struggles at times to keep up with his shouting, hoarse voice, that even when being pushed to the point when you're convinced his throat must be coming apart, seems insufficient to persuade you of all the ideas bubbling in his head. The drumming matches beat for beat, with limited kit and sparse fills. Each hit louder for its rarity, punch given power by space. "Last night a room full of drunks sang along to the songs I never had the courage to write… given the chance I'd stay in this chorus forever. Where everything ugly in this world is sadly beautiful…"
They admit it's a scam, a temporary reprieve, but we're never going to get anything better, no permanent safety, so why pretend otherwise? Anyone trying to sell you that is a liar. That is the core beauty of this record. It is people struggling with limited resources to express their ideas and beliefs. Not through long dialogue but in three minutes of song. Beat and rhythm matched perfectly to bring their truth to your heart, and when you're singing back at them, they've succeeded where politicians, adverts, TV and newspapers have failed to convince. Later success made Against Me! in to traitors with parts of their original following, major label signing lost them their 'nothing to loose' invincibility and increased their fan base. When this happens early adapters always feel slighted. For their early belief they now have to share with more people, you feel less special in a huge stadium crowd. Bands can't be the same forever, all great artists evolve. It doesn't matter if you're Henry Mattise or Led Zeppelin. It's the acid test between good and great acts; if you don't change and just repeat the same successful tricks, then you got lucky. If you try new things, make yourself vulnerable again, sometimes failing but mostly not, then you're great. If you can't get over a band's sound changing, that's your problem, not theirs. You don't have to go to the shows or buy the new CDs. But nothing stops you from loving the old music for what it was, and sometimes they still play it.